Browse through our list of most commonly asked questions. If your question is not addressed here, please call customer service or engineering, or contact us by email. Click on a question below. Click it again to close it. Can I use standard “H” pitch pulleys with BRECOflex CO., L.L.C. Convertible timing belt ATN12.7? No. Although the spacing from tooth to tooth (and cavity to cavity) measures 12.7 mm [0.50”] which is the same as standard Imperial H pitch, the ATN12.7 has a different tooth shape. The ATN12.7 timing belt tooth shape is designed wider than standard H pitch to provide adequate profile attachment material to accept the ATN insert. BRECOflex CO., L.L.C. can supply ATN12.7 timing pulleys that perfectly match ATN12.7 timing belts in most materials and sizes. Contact Applications Engineering to discuss specific requirements. What are the dimensions of the BRECOflex CO., L.L.C. self tracking timing belt guides? Two self-tracking belt guides are available. The K6 guide is used on smaller belts and the K13 guide is used on larger belts (see B212 catalog pages 60 – 77 for availability). Below are dimensions for both K6 and K13. I am fabricating system components to mate with BRECOflex CO., L.L.C. self tracking belts. What guide dimensions should I use to mate with the stand. timing belt self-track. guides K6 and K13? BRECOflex CO., L.L.C. manufactures self-tracking pulleys and self-tracking slider beds in custom sizes for all pitches that perfectly match our self-tracking timing belts. If however it is necessary to fabricate components to mate with timing belt self-tracking guides, use the following. Note that slider bed groove depth depends on the timing belt tooth height labeled E.
I have an existing BRECOflex CO., L.L.C. belt and I need a replacement. How do I determine the belt pitch? There are many methods of determining the belt pitch. One convenient method is to compare the existing belt to the drawings located at the top of each belt page of the BRECOflex CO., L.L.C. B212 catalog. These drawings are 1:1 scale and can help quickly identify belt pitches. Note that a printed page from a downloaded version may be scaled slightly by the printing process. I do not see a self-tracking version of a belt pitch I need in your product range. Can self-tracking belts be manufactured in all pitches? Yes. BRECOflex CO., L.L.C. produces self-tracking belts with one of two available manufacturing processes. The most popular self-tracking belts are manufactured with a molded, serrated, homogenous self-tracking guide. Non-standard self-tracking belts are manufactured with a solid self tracking guide. A solid guide can be applied to virtually any BRECOflex CO., L.L.C. timing belt style. For example, BRECOflex CO., L.L.C. does not list self-tracking Imperial L pitch because this style is not available with a molded, homogenous guide, but a self-tracking L can be manufactured with a solid guide. I am designing a robot for a school competition and want to know where I should start? What is the proper pretension for my belt and how do I apply the pretension? How do I calculate pretension? What is the acceptable pretension range? How do I apply pretension to a belt system? What are the common methods for setting and checking pretension? What are solutions for common pretension problems? 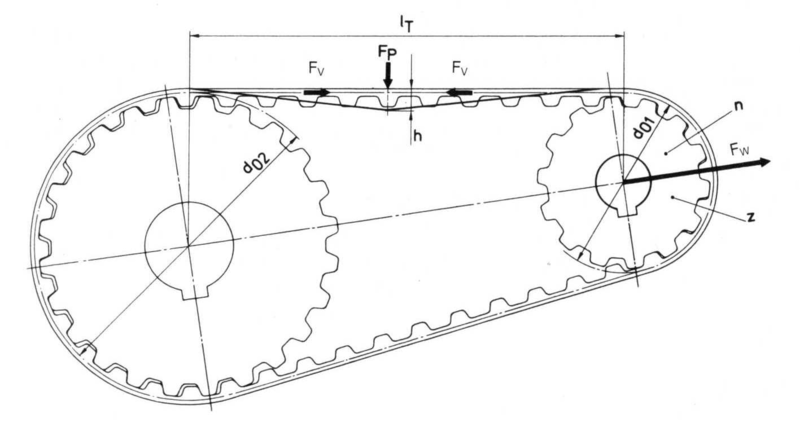 The applied peripheral force and the belt drive type determine the minimum acceptable pretension according to the SM5 Bulletin. Allowable belt tensile loading Fzul and bearing/shaft sizing limit the maximum allowable pretension. Refer to the B212catalog specification charts starting on pg.136 for specific values. At their maximum allowable tensile loading Fzul [B212 pg.136], steel cord belts elongate 4mm/m [0.4%] and Kevlar reinforced belts 6.6mm/m [0.66%] Elongation is related linearly to the applied force. Support the belt if horizontal to remove sag and set the pretension at zero. Make a scribe mark on the tensioner and a fixed reference point. Calculate the elongation required to obtain the target tension. Move the tensioner by the distance calculated. 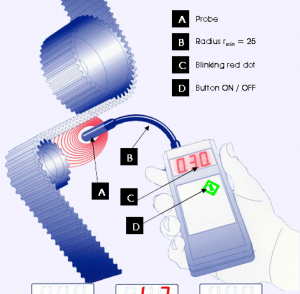 The meter displays the natural frequency of a vibrating belt span and this information can be used to calculate the tension in an existing drive. Alternatively a target natural frequency can be calculated for adesired pretension. Refer to the SM5 Bulletin for more details, equations, and examples. Attach an appropriate pull scale to one pulley shaft. Pull on the scale with twice the pretension force and then lock or fix the tensioned position. An initial pretension is guessed based on experience or using estimated values and one of the other methods as a starting point. Never exceed the maximum allowable combined allowable tensile load recommendation Fzul as found in the B212 catalog Specification Chart. Increase the tension if sag or flapping is evident under the maximum loading. If no sag or flapping is seen lower the pretension until you encounter sag. Tighten up the tension to the point that sag/flapping ceases. Record the tension using force deflection, force elongation, or a tension meter. An arbitrary force is applied to the belt and the deflection is noted. Force deflection is an inaccurate method of achieving a specific pretension in a belt due to problems with calculations, but can be used to precisely replicate a known working system. Contact Applications Engineering for details and formulas if required. Pretension should be increased in this case until the skipping no longer occurs and the belt runs without sag or flapping. Catenary sag, or sag under its own weight, on a horizontal run of belt will behave as a spring. The stiffness of a belt system is the major factor in repeatability and the spring action of the sag will have a negative effect. Pretension may be increased to reduce the sag and increase repeatability and reduce settling time. A designer is sizing a belt for use in a linear drive. Fzul values for allowable belt tensile loading include the pretension. Therefore an estimation of the required pretension is required. The designer takes the maximum applied peripheral force and consults the SM5 bulletin on. The application type is Linear Drive and an equal amount of pretension as peripheral force is recommended. A machine manufacturer is assembling multiple power transmission belt drives and wishes to speed the pretension procedure and increase pretension accuracy. The belt length is approximately 100teeth. According to the SM5 Bulletin the recommended minimum pretension is ½ of the peripheral force, but they have several existing drives that have been pretensioned experimentally and work well. The SM5 tension meter is recommended for the fastest and most accurate pretension setting. The vibrating natural frequency of the existing drive is taken using the SM5 and recorded in the maintenance log. The equations in the SM5 bulletin may be used to find the pretension of the existing drive or to find the natural vibrating frequency for a given desired pretension. Each new duplicate drive is tensioned to the same displayed frequency using the SM5. For further reading see the SM5 bulletin and catalog B204 pg.28. How can I predict the location of the top surface of my conveyor (or slider/support bed) relative to the pulley centerline? The conveyor top surface is calculated using pulley radii and belt thickness. T and English series belts engage differently with the pulleys than AT series and must be calculated differently. See our pulley catalog B216 page 8 for diagrams and formulas to accurately calculate the conveyor top surface. To calculate the location of a slider/support bed top surface, subtract the overall belt thickness from the conveyor top surface. What does SE in my metric T or AT series pulley part number mean? SE designates a reduced backlash tooth form for stock and custom pulleys. For T series pulleys of 20 teeth or less, BRECOflex CO., L.L.C. produces reduced backlash toothform as a standard. This is a performance enhancement decision made decades ago and has proved valuable. For part number clarification this SE designation is now indicated in the pulley part number. Be assured that this is a part number change only and the product itself has not changed from what has been produced in the past. Please refer to our new pulley catalog B216 page 9 for a chart of Standard and Optional toothforms. Does BRECOflex offer clean room certified timing belts? Although Polyurethane belts offer the lowest particle generation for a belt due to high abrasion resistance there will always be some particulation due to meshing of belt and pulley teeth and from guiding features like tracking guides and flanges. Alignment, drive geometry, pulley backlash, tooth facing, backings, and pretension differences change the rate of particulation. Our belts are not clean room certified. It is up to the machine manufacturer to obtain certification for the machine. Avoid backings or nylon facings PAZ/PAR i polyurethane timing belts are used. In some critical cases customers have sealed off the belt drive from the clean area and/or pulled a vacuum past the drive to prevent the migration of any particles. What is the difference between BFX and SFX truly endless belts listed in the catalog? The belts can be used interchangeably for most applications since they are rated for the same strength. SFX belts are cast-endless belts in gray-opaque polyurethane with a smooth or slightly ribbed back and are available only in specific fixed lengths. Heat-applied backings such as PU385 cannot be used with SFX belts and SFX delivery is longer than comparable stock BFX lengths. What is the standard pulley material and AISI grade? Standard pulleys and clamps are 6061 aluminum. This aluminum is suitable for anodizing and hard anodizing. If you are planning to anodize the pulley after you receive it let us know so we can provide the pulley diameters corrected for the coating thickness. Flanges are zinc plated steel unless otherwise noted. What are the available flange materials and attachment options? Standard flanges are rolled-on zinc plated steel. Standard flanges for T20/AT20/XH pitches and larger are screwed on. Custom flanges may be either rolled on or screwed on and made of zinc plated steel, uncoated steel, stainless, or aluminum. How do I cut open ended belting to length? For T10/H-pitch and smaller a sharp set of hand shears works well. Larger pitch belting requires either a bench-mounted shear or a carbon cut off wheel angle grinder will do the job in a pinch. Wear appropriate eye and hand protection. I had a jam and broke a profile off the belt. How do I fix it? While there are methods to reattach a profile in the field please keep in mind that a customer repair, especially with adhesive, will prevent us from performing a factory repair. Please call an applications engineer who will assist you in determining if the belt should be returned for repair. It is a good idea to have a photo of the belt available to email to us. Consider ATN convertible profile technology (catalog B209) in cases where profile damage occurs more frequently. Can I use common shafting throughout my multi-lane conveyor system? It is typical to use a common drive shaft at the exit end of a multi-lane conveyor. 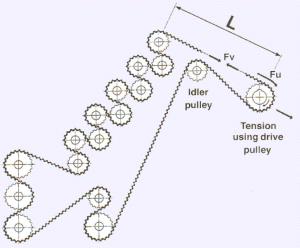 All other pulleys in the conveyor system should be individually bearing-mounted to avoid belt tension changes due to length tolerance differences. Independent tension adjustment is recommended for each belt to accommodate machine frame and any belt length differences. Matched keyways or aligned keyless bushings should be used when running matched sets of profile belts. Keyways can be specified aligned with a tooth or tooth gap and/or matched in sets. Please specify required alignment and accuracy on quote requests. I am running belts together in pairs or sets. How do I know if matched sets are available? Any time a set of belts is running together it is a good idea to run matched sets for accurate positioning as well as evenly distributed loading. Matched sets can be made in a variety of ways and it is also possible to match machined, profiled or covered belts. Profile mold selection affects the achievable matched set accuracy. The best matched set is produced by making a wide sleeve of belt and slitting it to the final widths after marking it with match marks and running direction. You can check the belt pitch page in the B212 catalog to find the widest available sleeve width. If this is not possible due to a wide final belt width we will take sequential material from the production run to make up the matched set. Independent tensioning is still recommended due to machine frame differences and the possibility that a machine user may replace just one belt out of the set. What cleaning solutions are acceptable for use on your timing belts? Depending on what takes the dirt/contaminant off you can use soap and water or alcohol. Acetone can be used to remove some adhesives. We recommend wiping the belt and letting it dry as opposed to immersing the belt in any cleaning solution. Prolonged exposure to cleaning chemicals can cause the belt to harden and crack. Repeated exposure to water-based cleaning may result in rusting of the steel cords. Chlorine cleaners should be avoided or rinsed from the belts as soon as possible. Special polyurethane compounds are available which have increased resistance to hydrolysis (water absorption) or oil attack. What is the difference between T-cover and PU385 back covers? Both T-cover and PU385 are clear 85 durometer solid polyurethane back covers with identical appearance. The difference is in the manufacturing process. T-Cover is applied as a liquid onto the belt back during a secondary extrusion process. PU385 is extruded separately then heat welded to the base belt after an order is placed. T-cover is only available 2mm thick (except for 1.5mm for T5). The surface of either cover can be smooth or ground depending on the base belt construction (ground for BFX with T-cover) or the backing thickness (ground for in-between thicknesses). Either cover may be specified with a ground surface if desired. If it is important to have a smooth or ground surface it must be specified in the part description. There is no friction or wear difference between the two backings since they are the same material. For spliced and welded endless belts, T-cover is preferred due to generally faster delivery, more pitch options, fewer minimum purchase requirements, and lower cost. Why are the pitch diameters listed in the new B216 catalog slightly different from the older B212 or B205 catalogs? The older catalogs listed the theoretical pitch diameter which is calculated according to (# of teeth * belt pitch)/pi. The B216 catalog lists actual pitch diameter when the belt is wrapped on a pulley including compensation for average tooth heights/depth, compression, and polygonal effect. Although the new values are more accurate in practice, either value is acceptable to use for center distance calculations and belt layout. This length difference is very small and well within the production tolerances of the belt. How do I write a BRECOflex part number?